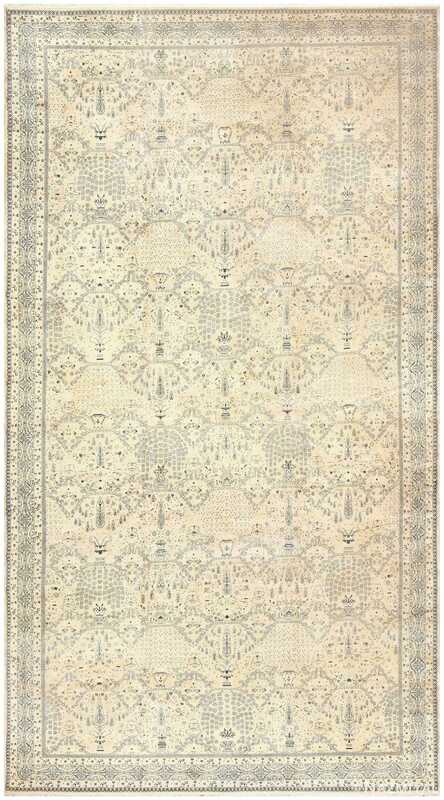 Floral rugs are one of the most universal and versatile devices available to carpet weavers around the globe. They are depicted in an overwhelming variety of colors, carpet design, styles and configurations that are always charming and beautiful. In the Ukraine and the Caucasus, flowers are often depicted in an abstract, stylized manner. Those produced in France tend to be lush, painterly, beautifully shaded and hyper-realistic. In China, symbolic lotus blossoms and ornate chrysanthemum flowers are transformed into decorative devices that are used in countless ways. In the early 20th century, Walter Nichols popularized a naturalistic floral style with graceful cherry blossoms and colorful flowers that dot articulated branches and shrubs. 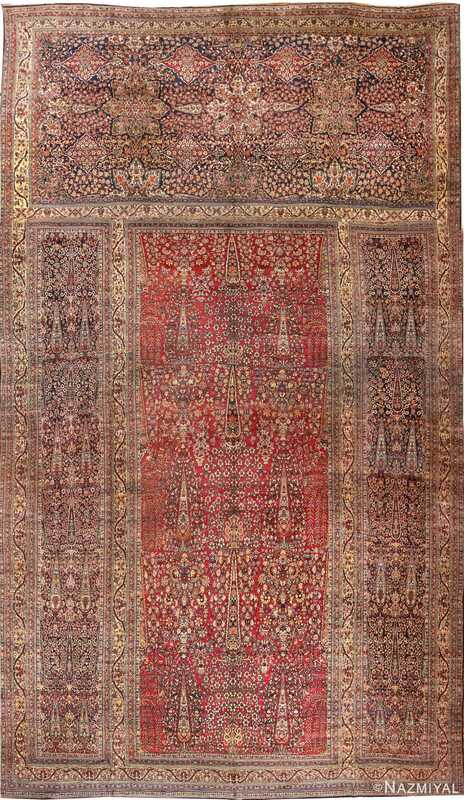 Weavers in Persia and India often transform flowers into stylized Shah Abbasi palmettes and radiant rosettes that become centerpieces for secondary botanical motifs. Regardless of their color, shape or rug size, lush vegetative floral motifs are universal and individual symbols. They are enduring, elegant and versatile. Botanical motifs aren’t always diminutive feminine decorations. They can be bold, decorative luminaries that dictate the placement and appearance of neighboring elements. 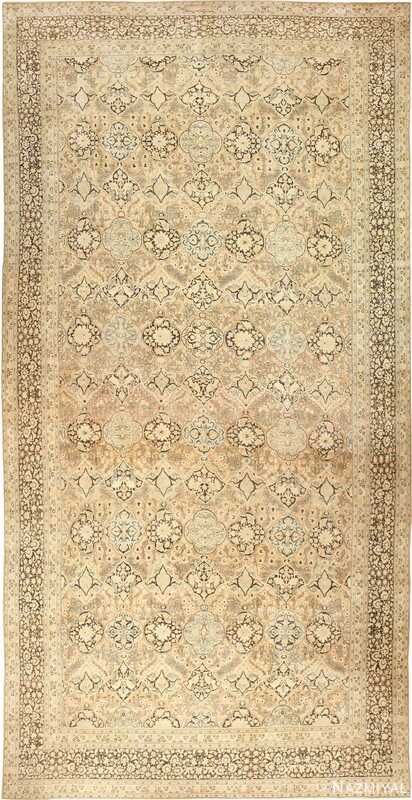 Flowers can be symbolic devices, naturalistic motifs or formal elements that add grace to the carpets they adorn. Whether they are depicted as a casual bouquet, an arching garland, a radiant medallion or a tasteful repeating pattern, floral elements are among the most classic motifs ever devised. 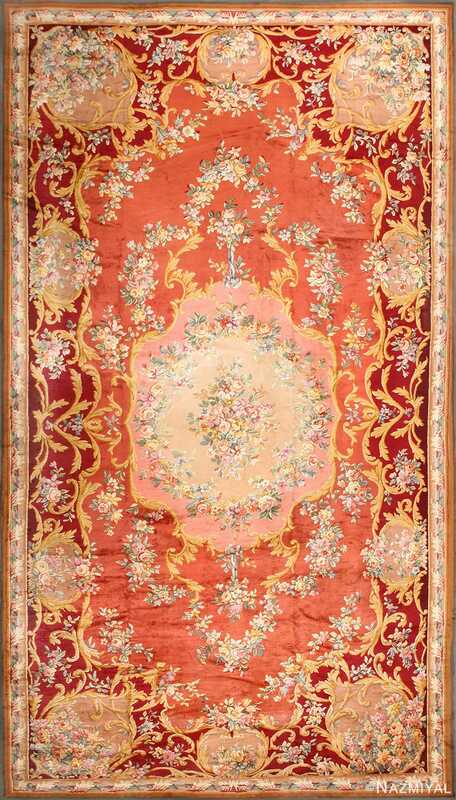 Floral rugs (or city made carpets) are woven with curvilinear patterns often with central medallions and reflect a close affinity with nature. They are intricately woven with a fine knot count and a colorful harmonious palate. 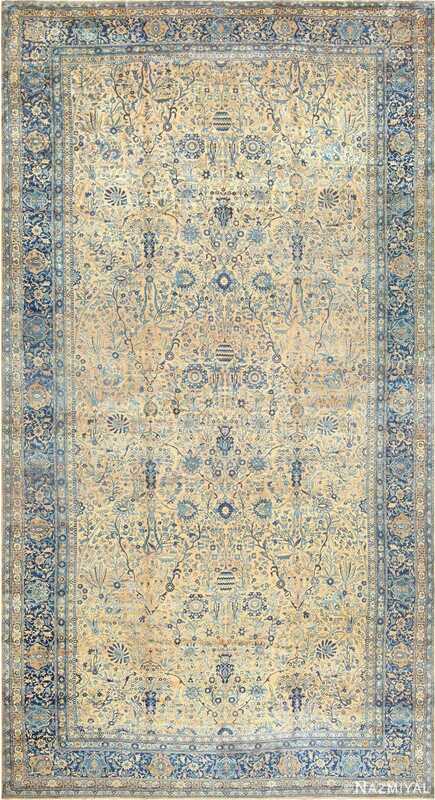 The famous city carpets of Persia, like this beautiful Kerman, are almost always woven with floral motifs, but these organic forms can also be found elsewhere in the world. For example, this exceptional Indian Agra flaunts a series of palmettes and rosettes against a gorgeous sea green ground. Early 20th century Chinese Deco rugs are also famous for their floral arrangements as is exemplified in this oversize Art Deco rug. The wild world of floral rugs – Flowers are universally popular, so it’s no surprise that floral rugs are among the most enduring and prevalent styles. From Europe and Bessarabia to America and Uzbekistan, flowers have inspired many astoundingly decorative patterns. These designs include expressive stylized blooms and abundant European bouquets that have painterly shadows and lifelike details. 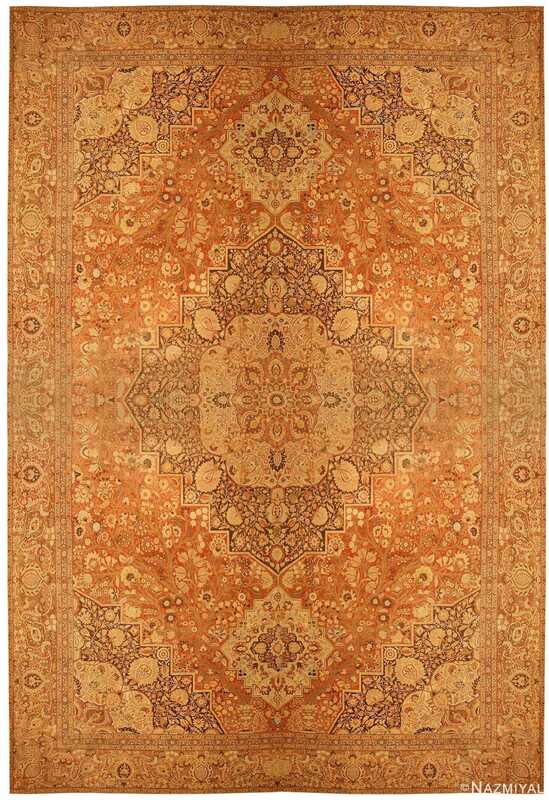 The wild world of floral rugs spans the continents and covers centuries of artistic creations. 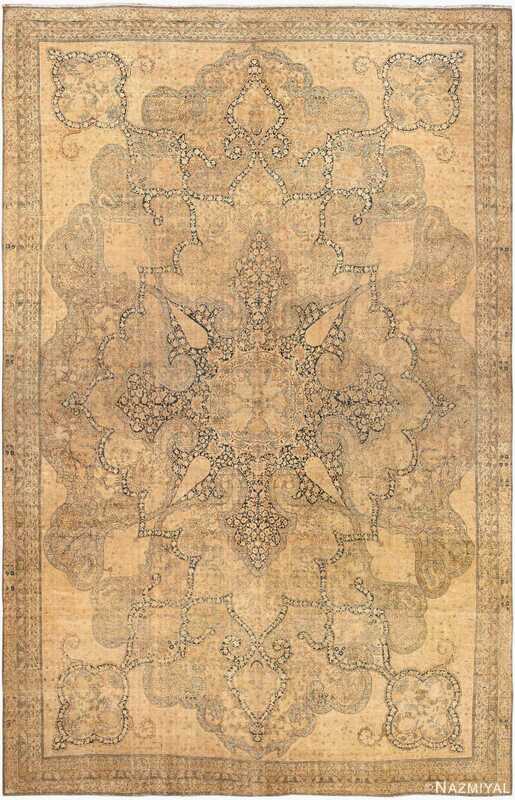 Today, antique rugs with floral patterns feature abstract blooms and bold floral patterns, but these botanical motifs were years in the making. Pop art rug designers in the mid 20th century created many expressive floral rugs too, but these designs still hearken back to important historical patterns. The lush, large-scale blooms featured in chintz textiles and old world embroideries have sparked a modern revival of classic period patterns. Whether floral rugs have a stylized appearance or a preference for realism, it’s impossible to deny the timeless beauty of these naturally stylish pieces. We feature a gorgeous selection of floral botanical rugs that can help you define your room’s decor without overwhelming the environment. 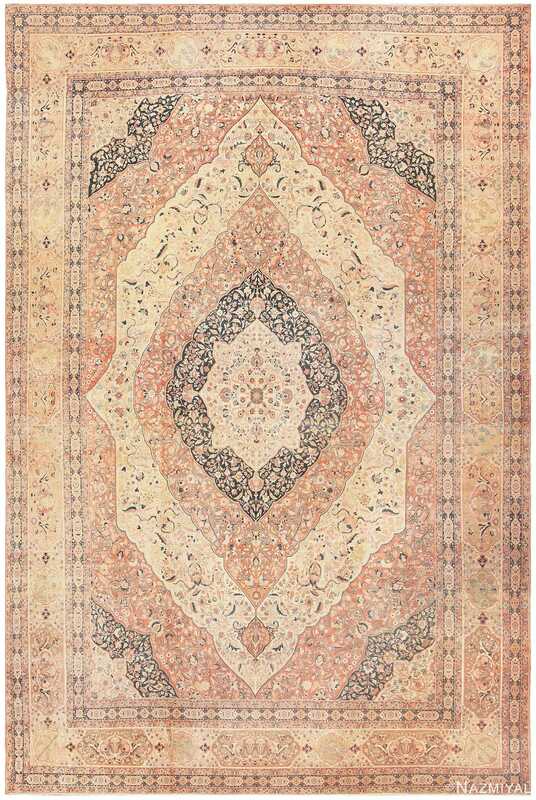 The botanical selection features several beautiful rugs available in a number of neutral hues and vibrant jewel tones. 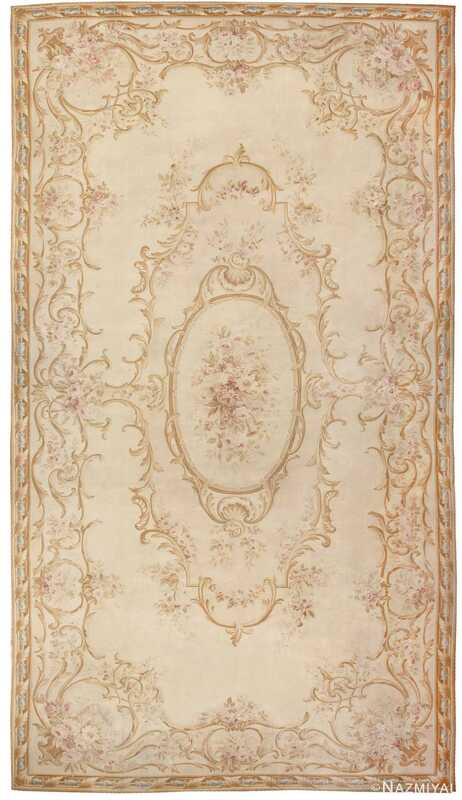 Floral design rugs add an attractive focal point to the room. They are often used in a way that is similar to an accent wall, where even colors and patterns that do not seem to match the existing decor can contribute to the atmosphere in a defining and memorable way. 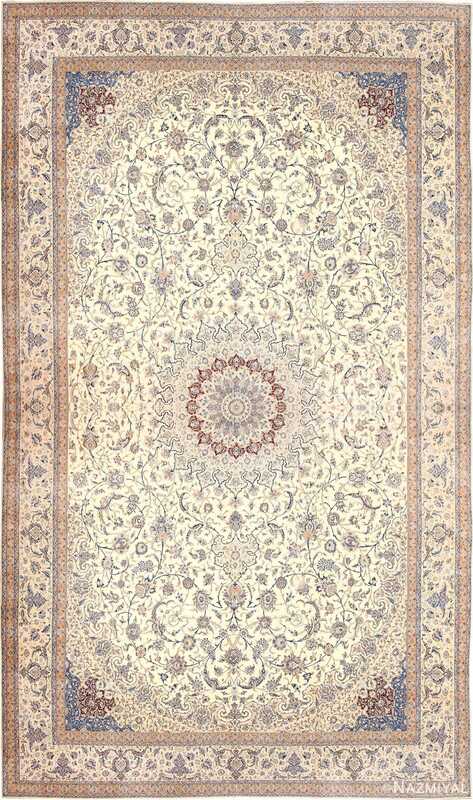 As such, these rugs, adorned with beautiful flowers, are ideal for all types of rooms. 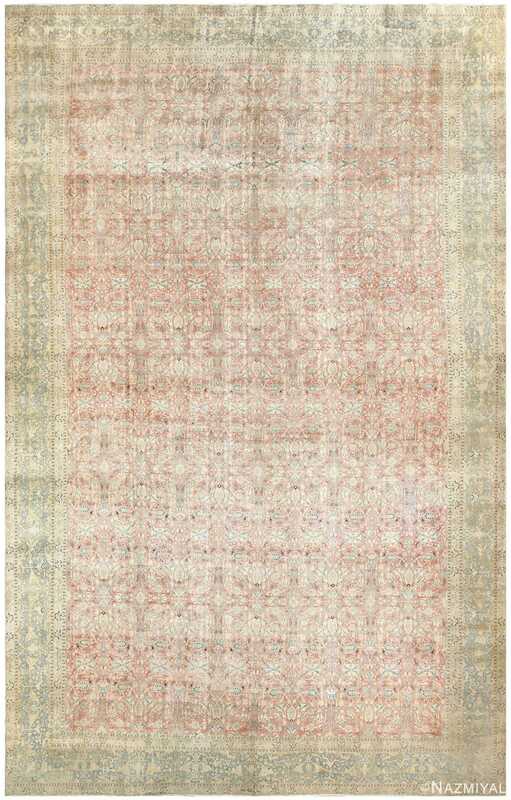 To optimize the appearance of the rug, many designers recommend for homeowners to organize with every color in mind to find a common theme or motif. Rugs and carpets with multiple patterns and colors may help homeowners decide on an optimal location according to the way the patterns are presented. Flowing designs and lighter hues are often chosen as a way to add accent to an area, resulting in the rug itself providing the room with an elegant touch of support. Darker tones and more rigid shapes, on the other hand, are often a powerful grounding force, which allows users to elegantly set them as a centerpiece. Depending on the desired results, homeowners can arrange their rugs as accenting pieces or breakaway objects depending on the level of contrast present. A little bit of contrast can break up the space and reground the viewer’s vision in the desired direction. Other popular trends include using the jewel tones as scene-setters in cool and soothing areas. The primary jewel colors often add a necessary royalty to some homes, similar to the way marble can add class and character to a floor in an entryway. The tone are chosen to emphasize the cool colors of the surrounding atmosphere, making them perfect for blues, greens and darker neutrals. Heavier colors are often best chosen for areas that feature light neutrals. Because of the seemingly natural colors chosen for the rug, it can also look right at home in areas that feature abundant floral life, whether inside the room or visible in the surrounding windows. Effectively broken up into four constituent parts, this extraordinary antique Kerman carpet is almost four individual carpets in one. 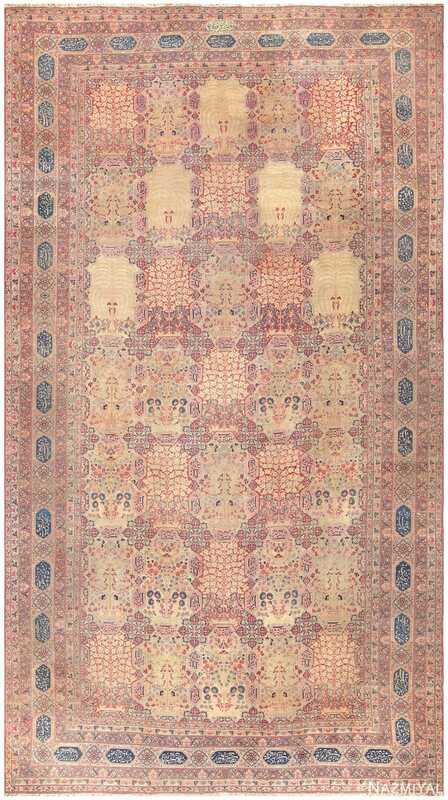 This elegant Haji jallili Tabriz from Persia is a masterpiece of counterpoint in soft color and complex design. 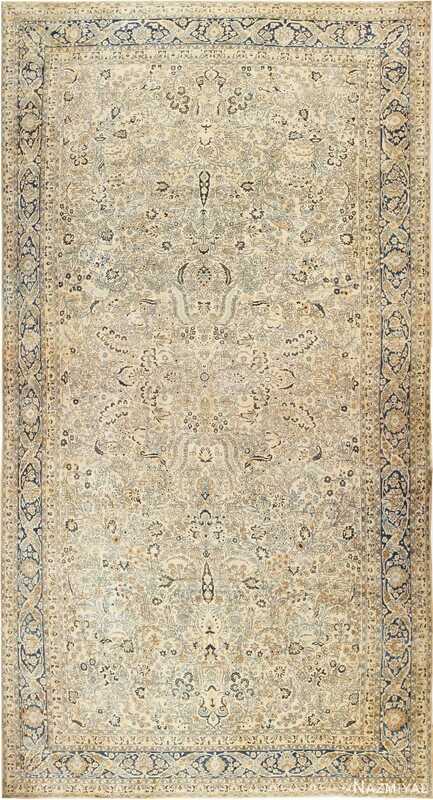 This grand, palatial antique Kerman carpet from Persia is one of the best of its kind. 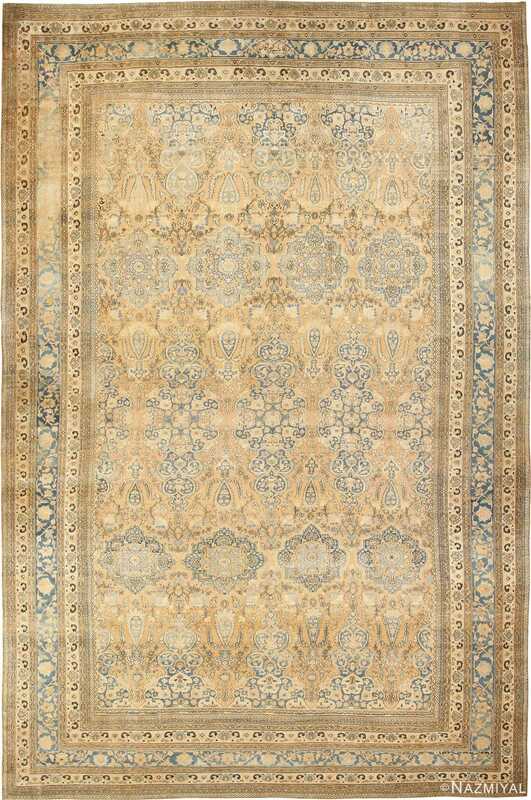 Kermans like this are among the most elegant antique Persian carpets designed in the classical tradition. 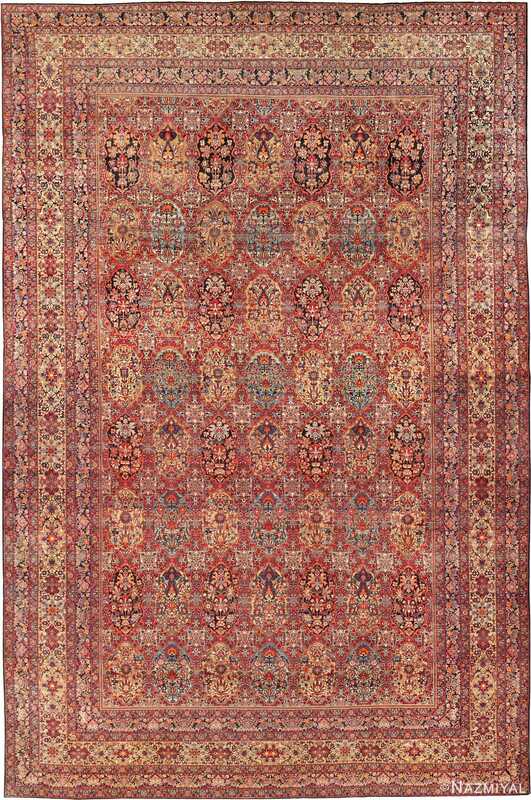 This overwhelmingly beautiful antique Persian Kerman rug depicts a palatial medallion with layered curves, sweeping contours and fantastic botanical decorations. 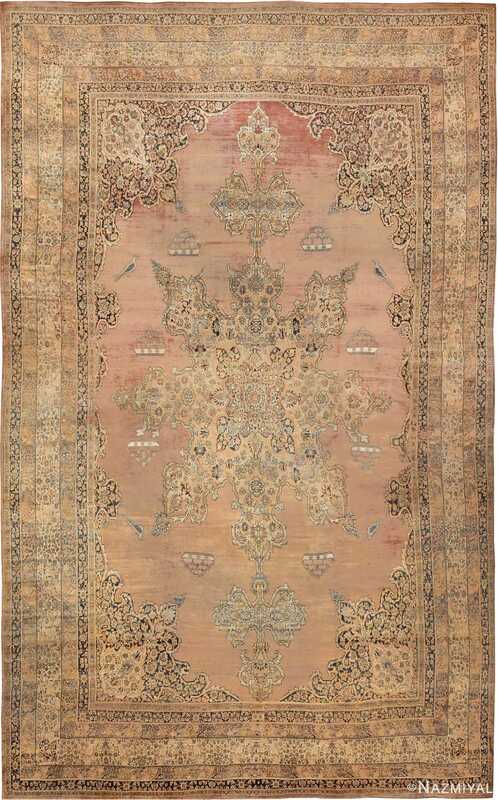 With its rich colors and arresting proportions, this antique oversized Persian carpet is a palatial statement piece that embraces the lavish style of Kerman. 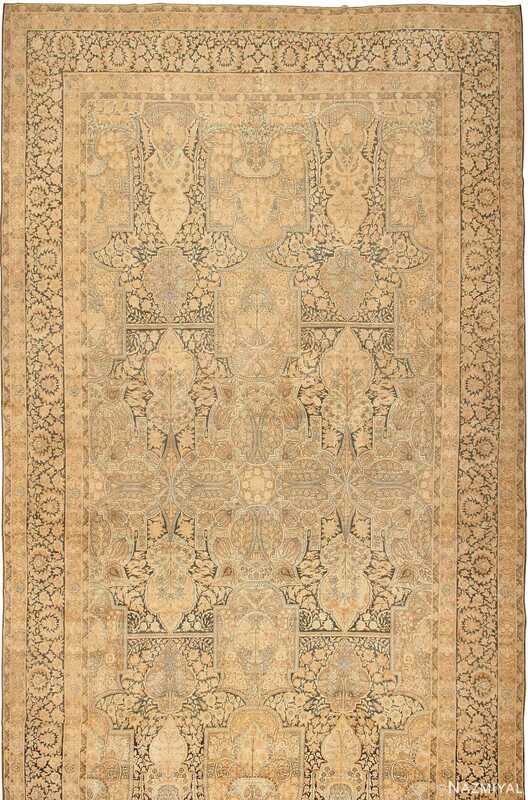 This impressive antique Kerman rug from Persia features an especially intricate allover pattern, steeped in classic beauty.